Keeper HD is a simple-but-effective note-taking app for the iPad. The $2 offering from Hubapps.com is so streamlined, you almost wonder if there’s much that separates it from the built-in Notes app that already comes with your iPad. The answer is “yes,” but the app also has a notable shortcoming for anybody who uses multiple devices. For the most part, Keeper HD behaves very much the same as Notes. The two apps look different, and getting away from the lined-yellow-tablet look of Notes might be appealing for those who prefer Keeper HD’s clean-white-sheet-of-paper appearance. Otherwise, the essence is the same: Hit the plus (+) button in the corner to create a new document, and start typing. Keeper HD auto-titles the document based on the first line you type. The menu lists the notes you take in reverse-chronological order—most recent note at the top of the list—and offers a search function to let you find the specific documents you’re looking for. So far, nothing new. Keeper HD offers two features that distinguish it from Notes, however. The first is the the ability to use the iPad’s multitouch capabilities and “pinch” your notes’ font size, much the same way you zoom in on text in the Safari app to better see what you’re reading. This detail is an advantage for sight-impaired users who wish to make the text bigger and more readable. Some users might find it a bit of a drawback, as the font size changes you make in one note apply to all the documents within the app. Take Note: Keeper HD offers much of the functionality of your iPad’s built-in Notes app; however, Keeper HD lets you adjust the font size of your notes by pinching and zooming. The app’s other distinguishing feature is its undo-redo function, which acts as a kind of very basic versioning history of the notes you’ve taken. Tap the left-pointing arrow and you’ll be returned to an earlier version of the document you’re composing; tap the right-pointing “redo” arrow, and you’ll be returned to the latest version of that document. For note-takers and writers who like to revise and revise again, this is very helpful. But there’s one area where Keeper HD falls short of Notes’ functionality: Sharing. Both apps let you share documents via e-mail. That’s where Keeper HD stops, however. Apple’s Notes can be synced with your Gmail account, letting you access iPad-created documents from your computer desktop. And with the advent of iCloud, you can sync the creations of your Notes app across multiple iOS devices. 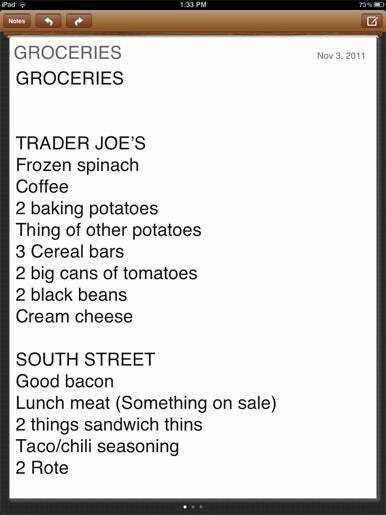 I can—and have—made my shopping list at home using the iPad, then read it on my iPhone’s Notes app when I’m at the grocery store. That’s not a feature available for Keeper HD. For me, that deficiency undermines Keeper HD’s positive points. Your mileage may vary, however, and syncing may matter less to you than Keeper HD’s good qualities. For the most part, this app really gets the job done.